GoldBio’s protease inhibitor cocktails are ready-to-use solutions that contain irreversible and reversible protease inhibitors at optimized concentrations to inhibit serine and cysteine proteases, as well as other proteases. These cocktails are available EDTA free, making it perfect for 2D gel analysis, or they are available with an optional EDTA solution for the inhibition of metalloproteases. A broad range, 100X concentrated, ready-to-use protease inhibitor cocktail. 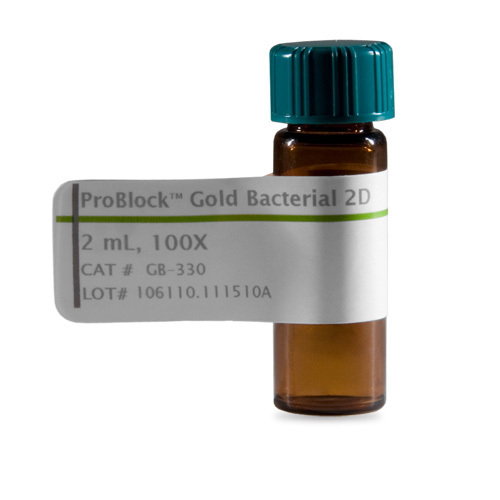 ProBlock™ Gold Bacterial 2D contains optimized concentrations of various bacterial protease inhibitors, which provide excellent inhibition of protease activities during recombinant protein purification from bacteria. The cocktail contains both reversible and irreversible protease inhibitors to inhibit metallo, serine and cysteine proteases. It also contains specific inhibitors for bacterial proteases, such as aspartic proteases and aminopeptidases. A 1X concentration of Bacterial ProteaseArrest™ inhibits over 90% of protease activities. 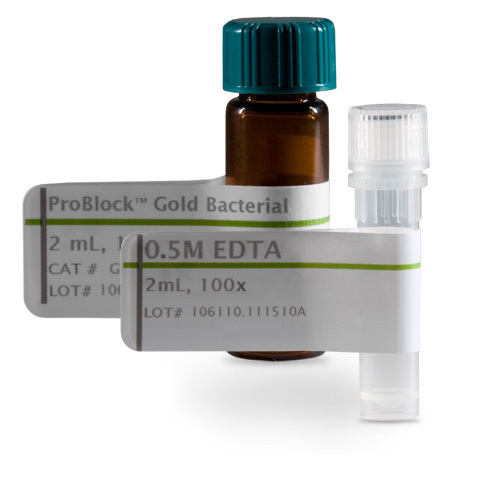 ProBlock™ Gold Bacterial 2D cocktail does not use EDTA as its metalloprotease inhibitor as it would inhibit the activity of proteins that require divalent cations (Ca2+, Mg2+, or Mn2+) for their biological activity. In addition, EDTA would inhibit the purification of proteins using immobilized metal affinity chromatography (IMAC), for example His tagged or CBP tagged proteins. ProBlock™ Gold Bacterial 2Dcocktail is compatible with immobilized metal affinity chromatography. 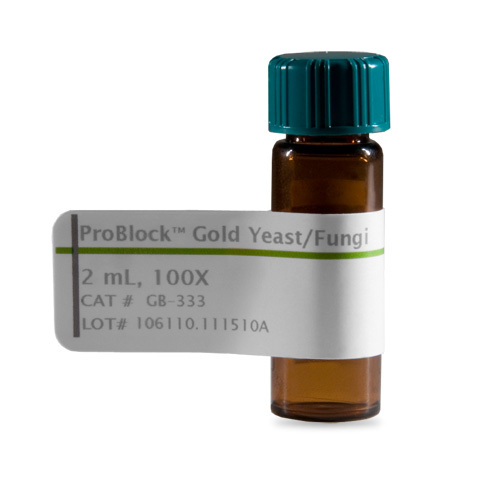 ProBlock™ Gold Bacterial Protease Inhibitor Cocktail contains optimized concentrations of various bacterial protease inhibitors, which provide excellent inhibition of protease activities during protein purification from bacteria. The cocktail contains both reversible and irreversible protease inhibitors to inhibit serine and cysteine proteases. It also contains specific inhibitors for bacterial proteases, such as aspartic proteases and aminopeptidases. A 1X concentration of ProBlock™ Gold Bacterial inhibits over 90% of protease activities. Optional EDTA is provided to inhibit metalloproteases. Some proteins require divalent cations (Ca2+, Mg2+	or Mn2+) for their biological activity and the presence of EDTA may be detrimental to the protein’s activity. 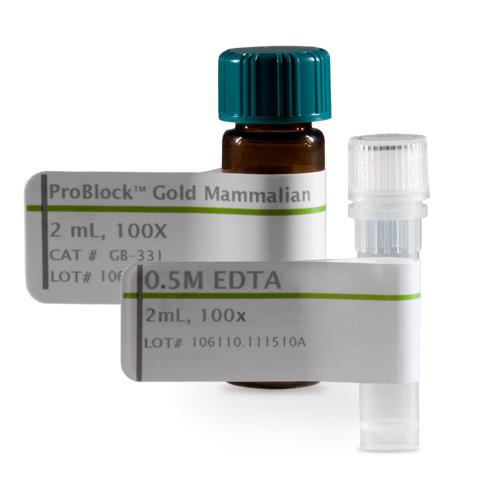 ProBlock™ Gold mammalian protease inhibitor cocktail contains optimized concentrations of various mammalian protease inhibitors, which provide excellent inhibition of protease activities during protein purification from mammalian cells and tissues. The cocktail contains both reversible and irreversible protease inhibitors to inhibit serine, cysteine and specific inhibitors for mammalian proteases, such as aminopeptidases. A 1X concentration of ProBlock™ Gold Mammalian inhibits over 90% of protease activities. Optional EDTA is provided to inhibit metalloproteases. Some proteins require divalent cations (Ca2+, Mg2+ or Mn2+) for their biological activity and the presence of EDTA may be detrimental to the protein’s activity. 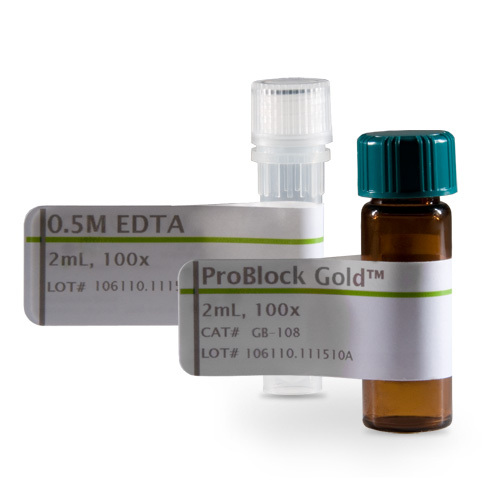 Furthermore, EDTA inhibits the purification of proteins by immobilized metal affinity chromatography; EDTA, therefore ProBlock™ Gold Mammalian is supplied with an optional EDTA solution. 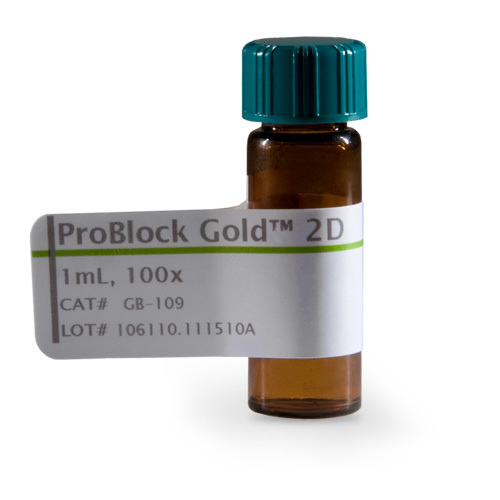 Due to the optimized concentration of the various inhibitors, the ProBlock Gold™ shows excellent inhibition of protease activities and is therefore suitable for the protection of proteins during purification from animal tissues, plant tissues, yeast and bacteria. 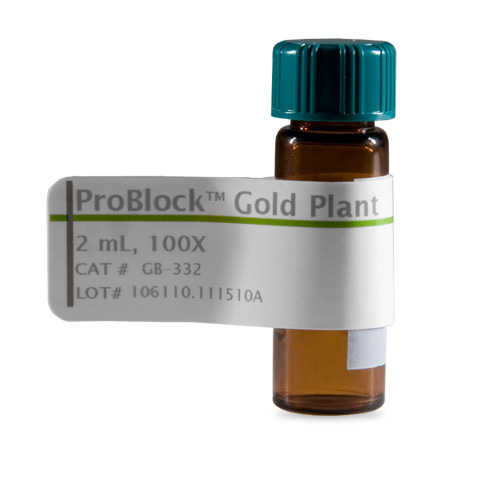 ProBlock Gold™ contains both irreversible and reversible protease inhibitors to inhibit serine, cysteine and other proteases. An optional EDTA is provided to inhibit metalloproteases. Since some proteins require divalent cations like Ca2+, Mg2+ or Mn2+ for their biological activity, the presence of EDTA may be detrimental to the protein activity. Furthermore, if the protein of interest is purified using immobilized metal chelate affinity chromatography; EDTA must be removed from the buffer before the chromatography. The ProBlock Gold™ is therefore supplied with an optional EDTA solution and may be added in the extraction buffer or lysate as needed. 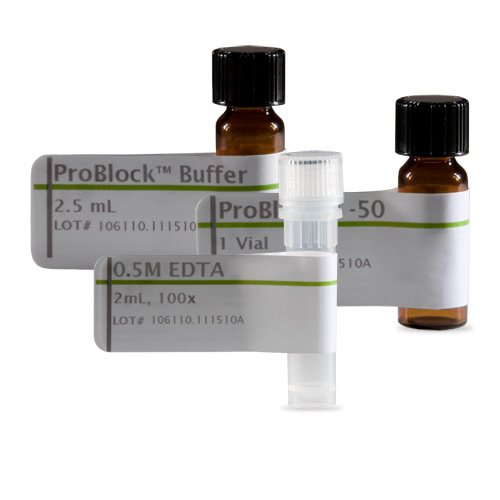 ProBlock™-50, EDTA Free is designed for large volumes of extraction/lysis buffers and is supplied as 1 vial/kit (Cat# GB-326-1), 10 vials /kit (Cat# GB-326-10) or 20 vials/kit (Cat# GB-326-20), with each vial suitable for 50 ml. ProBlock-50, EDTA Free protease inhibitor cocktail contains optimized concentrations of various protease inhibitors, which provide excellent inhibition of protease activities during protein purification. 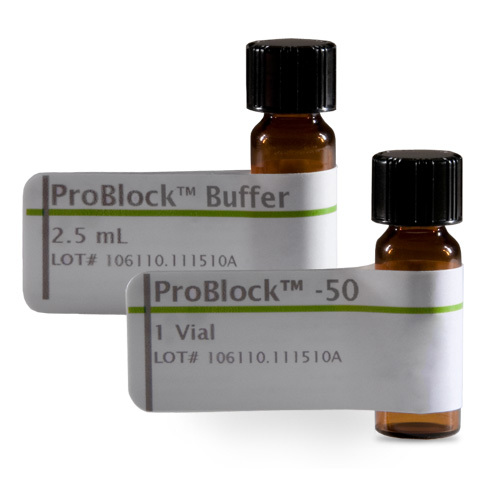 ProBlock™ is a superior general protease inhibitor cocktail that is suitable for purification from mammalian, plant, bacteria and yeast samples. The cocktail is EDTA free and contains both irreversible and reversible protease inhibitors to inhibit serine, cysteine and other proteases. 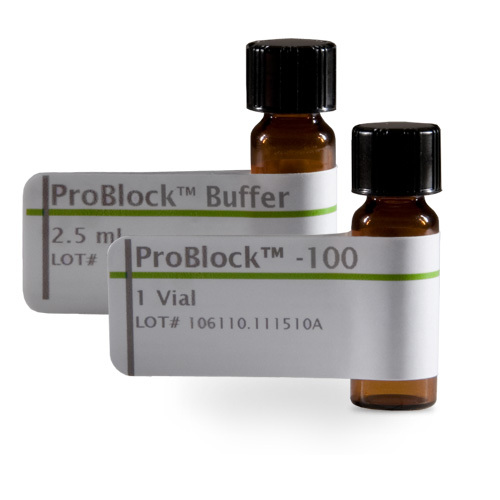 At 1X concentration, ProBlock™ inhibits over 90% of protease activities (e.g. Mouse Pancreas Extract 0.5 mg/ml protein).